Encouraging people to walk to destinations, or just to walk around, can be a hard sell if an environment does not facilitate travel by foot. 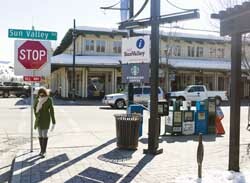 The Ketchum Community Development Corp. wants locals, visitors and the passers-through to get up close and personal with all that the city has to offer. The KCDC's new project, "Walkability," aims to make it not only easier, but more pleasant and more informative to stroll, power walk or commute by foot. KCDC representatives presented the idea to the Ketchum City Council on Monday. "It's a great opportunity to pull together several aspects of our community," said Dale Bates, project manager and KCDC board member. The KCDC hopes to improve people's health and safety, increase sustainability by reducing energy for street lighting and transportation, facilitate access to bike paths and public transportation and enhance community vibrancy. Areas targeted are the downtown core with walking corridors linking adjacent residential neighborhoods. The project will align with existing wayfinding plans. "It will be based on the Downtown Master Plan but it will be adding a few more pieces to it," Bates said. The project will combine elements such as sidewalks, lighting, maintenance and signs. Signs would be directional and locational as well as historical. "How great for people who live here, how great for people who visit here to have that integration with their history," Bates said. Included in the first phase will be a solar street light demonstration for a section of downtown. Bates will lead a corps of volunteers to establish a vision and develop an action plan. Initially, small groups will hit the streets looking for what's wrong, what's right and what can be addressed in the near- and mid-range future. Initial aspects of the plan could be done by this Fourth of July. The current phase of the project is being funded by the KCDC. Construction costs could be paid for through grants, the KCDC, private donations, the Ketchum Urban Renewal Agency and the city. Bates said the fact that Ketchum already built the Fourth Street corridor and Town Square gives it an advantage when applying for an Idaho Community Development Block Grant.